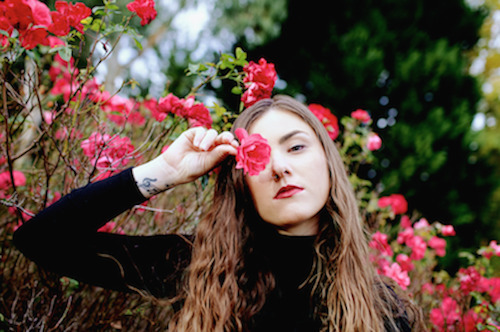 Fresh off a National Tour (Adelaide, Melbourne and Sydney) Adelaide based artist MANE (a.k.a Paige Renee Court) is delivering up some haunting vocals on her new EP House of Horror. Based on a string of personal experiences, the music is lilting, transportive and injected with a gorgeous, melodic overture that only this young female musician can deliver. On the drive to Melbourne. It's raining quite heavily and we've just actually come into Bordertown right now. We're not halfway there, but we've made some kms already. We've probably just got under 5 hours …! I've got a bit of Meg Mac, Thelma Plum, but we actually haven't put any music on as yet, I've got my guitarist (Louis Donnarumma) with me and we've just been chatting. Well, I started writing the songs .. some of them came together – wrote that ohhhh, probably two and a half years ago now. Then some of the others are quite new, I finished writing them in the studio. I went into the studio up in Gippsland in Victoria with a producer called Jack Hookey and his studio completely in the middle of nowhere, surrounded by hills and stuff so it was really, really nice. We sort of locked ourselves away from the week and sort of wrote all the tracks. There was hardly any signal as well, so we got to keep off our phones which was kind of nice. I started singing when I was sixteen and I started doing a bit of covers. I did Adele and Dylan (Bob) - that was my favourite, that I love still, but I listen to an array of music so I can't really pinpoint who my major influences are, but, there is definitely a bit of blues tone. I like to keep that and have a sort of, subtle bluesy tone in the background – sort of sitting in the song. It comes however, I write the song (her particular sound) and the song evolves from there. Gig in Adelaide – sold out, wahoo! That was really great – the Adelaide launch for the EP – I had a lot of fun with that one. Everyone was really getting behind the songs and we had a few reviewers came in and they gave us a good plug. So, we got a good wrap. I've got Melbourne this Sunday (July 24th) and Sydney on the 29th at the Newsagency, I'm really looking forward to those sessions. I drive back to Melbourne, and then fly to Sydney, it's a bit too far to drive! I've played in Melbourne quite a bit, I've played there twice and I've played in Sydney once. In Adelaide I played with a band, but in Melbourne and Sydney it is going to be a bit more stripped back. The venues are a bit smaller, but I have a great guitarist Louis Donnarumma and he is going to be playing with me. We are trying to create a stripped back version of the songs but keep the vibe the same. I always like to play stripped back, it's what I have been doing for a while. But with these shows, to be honest, for the most part, it's availability of band members and of course money comes into it! I'm really hoping to record and release a new song later in the year and also heading to the States in September and playing Mondo festival (Mondo.NYC) in New York. It is my first time in the States it is going to be really fun. I just applied I had a meeting with Sounds Australia and I told them I am going to be there for the Americana (AmericanaFest) festival and they let me know about the Mondo festival, so I got on and applied straight away. I actually just found out on Monday that I got in! I'm really stoked about that. I am really looking forward to it, I think the ticket sales have gone really well so hopefully we get a good crowd in and we can sell some CDs!